I took baby Khlo for her 9 month appointment last week where her incredible pediatrician went casually down the checklist to make sure Khloe was meeting all of her developmental milestones. Immediately, my mind filled with images of rubber-edged tables and zip-tied cabinets. I have the electric sockets covered. Well, most of them. I always forget to put them back in after I vacuum. The cleaning supplies and medicines are higher than Kiara’s reach from her big stool. Better check that….think she just had a growth spurt. 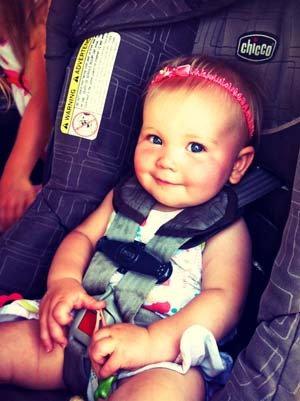 But every mom knows that no matter how much time and energy spent on babyproofing, your child will find its weaknesses. And fast. It’s in our nature to be curious. Ahh, yes. I’m a mother of two. I get to wear the Been There Done That badge with pride. Moms of 3+, you’re on a whole different playing field. Hats off to you, my friends. I’ve done bumps, bruises and profuse bleeding. And that’s just from my husband. Are you a nominal believer who claims Christ but buffers herself from the idea of living dangerously? Have you padded every corner, not wanting the sharpness of the gospel to penetrate your heart or to offend those from whom you seek approval? WHO ARE THOSE PEOPLE!? Do you dare identify them to yourself? Could you write down their names? Do you close off every door of opportunity, afraid of what scary, harmful thing may be on the other side? He could ask you to sell every single thing you own. Move your family. Go somewhere scary. Step out of your comfort zone. Are you willing to risk bumps-on-the-head? Let’s take it back to the basics. Remember Sam? Sam had a friend. He would not try green eggs and ham. He would not, could not here or there. He would not, could not anywhere. Not on a boat, not in a tree, not in a car. Just let him be. He did not like green eggs and ham. He did not like them, Sam-I-Am. Don’t be scared of what you don’t know. Don’t be scared of what other people might say. Don’t be scared to bump your head. Surrender fully to Him. Take the covers off of the sockets and the bumpers off the edges. Set your sights on the one whose word is a lamp to your feet and a light to your path. Live dangerously. Jump in the deep end. What keeps you from full surrender? Who keeps you from full surrender? What safeguards have you put in place to keep you from living dangerously? This entry was posted in Uncategorized and tagged calling, parenting on April 30, 2013 by Amy Barnes. Jodi was in my Lifegroup at the Movement in San Marcos before we started with the Life Mission Church plant. So picture this, everything is totally normal, we’re at Lifegroup and I’m having a conversation with her about adoption, as well as some tummy aches she’d been having. Just a normal Thursday night. Then, before you know it, we heard the news that Jodi had a 12 inch tumor on her ovary. Over time, we learned that Jodi was diagnosed with a rare form of ovarian cancer. Surgery, more tumors, transfusions, chemo, fluid-filled lungs, insane nausea….craziness. (My info is generally coming through FB, so forgive me Jodi if I have made any mistakes). She has been through crazy amounts of trials, more than most of us have or will ever face. Jodi is about the same age as I am. She is being treated at the Cancer Treatment Centers of America in Arizona. Would you take some time today and pray for Jodi? Specifically, she just started a new round of chemo after her last round didn’t receive the results they’d hoped for. Please pray that her body responds well to the new medications, and for HEALING! Also, if you feel like you’d like to donate toward her care, you can help her reach her goal of $30,000 HERE. Thank you all for your prayers! 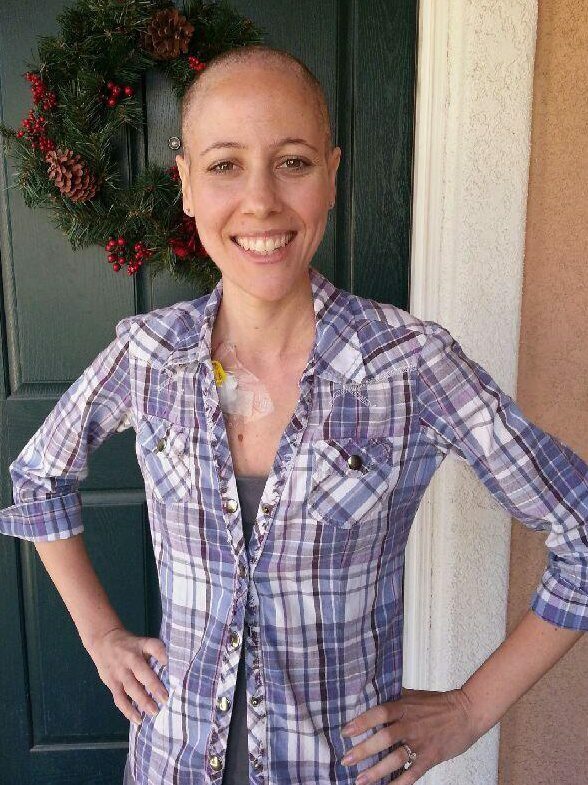 If you are praying for Jodi, would you mind leaving it in a comment on this post for her encouragement? THANK YOU! This entry was posted in Uncategorized and tagged Pray for Jodi on April 23, 2013 by Amy Barnes. We are all about happiness in America. Especially in San Diego. Yesterday, as I walked through Sea World with my family and some friends, I found myself thinking about the zoo passes that we need to renew and I really can’t wait to try paddleboarding and HEY! Maybe we can splurge and get those Disneyland annual passes for the girls’ birthdays this year (dreamland). Being surrounded with endless entertainment options and cool learning experiences can lead to us jumping from one happy thing to the next. It’s hard not to be happy when you’re watching two killer whales do backflips in tandem! I mean, come on, how in the world do they get them to do that?! “Hey, you gigantic killing machine…why don’t you just do a little twirl for me over here and I’ll give you a fish?” Crazy. Then, as you’re leaving Sea World you get a text telling you about Boston. Suddenly, the theme park music fades and you look around, sickened. The happy little world that was lighting up your baby’s eyes an hour ago goes black, and you’re reminded that evil still exists. Ugh. My heart just wrenches thinking about…..all of it. The lives lost. The families. The kids. The pain. The terror. The chaos. The countless hours of training, dedication, travel, planning, praying and hoping that all of the runners and supporters and organizers went through in preparation for the event, marred by a senseless act. Sometimes the real world is just too much. We’re content in happy land and then the bottom drops out. And it just doesn’t make sense to us. Why would anyone want to do that? Why don’t they all just want to be happy too? Why do people do stuff like this? It’s too much. Fresh wounds need their own space. Newly bruised spirits need compassion, not analysis. So today let’s just “weep with those who weep” (Rom 12:15) and know that though our world is cruel and senseless, we still cherish seeds of hope. 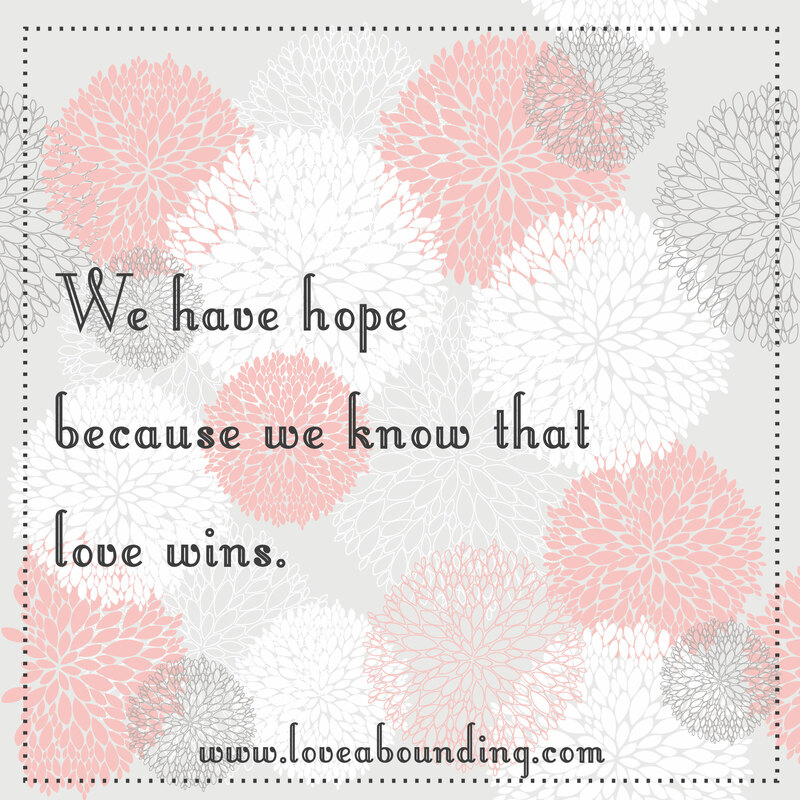 We have hope because we know that love wins. This entry was posted in Uncategorized and tagged love, suffering on April 16, 2013 by Amy Barnes. Khloe and I have been playing a lot of peek-a-boo lately. I’ll hide behind a blanket, pop out and growl like a lion or make some kind of silly sound that sends her into hysterics. We get such a kick out of it that I’ll keep doing it over and over and over again, trying to elicit that baby belly laugh that is one of the sweetest sounds ever created until my cheeks ache from grinning. One of the neatest things is seeing how she has now begun to realize that I’m still there behind the blanket. Did you know that there’s a technical term for Peek-a-boo? Yes, leave it to us to give peekaboo a psychological name. I wonder if there’s a named syndrome for lacking peekaboo skills? The technical term for peekaboo is “object permanence.” Object permanence is one’s ability to understand that an object still exists even though it isn’t visible. Are you believing God even when he is not visibly present to you? Through the periods of drought, are you seeking him and believing him still? For a good crop to grow, it must endure a dry period. We are to know our Savior always, not just in the times when His presence is manifest and obvious (how much faith does that require? ), but we voraciously seek him in and out of season, knowing that he’s still there. God doesn’t disappear, and neither should we. If we are active in our faith only when He’s manifest, we pop in and out of consciousness and miss out on the beauty of relationship. What if you were stoked on a new song and downloaded it, only to find that the music kept cutting out…on, off, on, off, on, off. Would you be able to enjoy the song? Would you ever listen to it? Would it be meaningful at all to you? Would you share it? The Christian walk is not meant to be a few pretty notes smattered on a page. Your relationship with your Heavenly Father is a masterpiece of unfathomable quality, with chords and harmonies and nuances that are perfectly and uniquely composed as a love letter of grace to you, orchestrated for His utmost glory. If we only listen when the high notes hit, we miss the romance of the song. Believing that God exists is one thing. Seeking him though he is not seen is another. We don’t forget Him the second that we don’t see him because we are not babies anymore. We’re done with peek-a-boo. We get the whole “object permanence” thing. We understand that drawing near to God also means seeking Him, and for that we are rewarded. What’s the reward? THE SONG! The relationship. The symphony of seeing His hand at work, of resting in the grace bath that He’s drawn for us, of being sanctified as we sit in awe of the timbre of His majesty. What good is belief without pursuit? And, if we are not in pursuit, do we truly believe? This entry was posted in Uncategorized on April 10, 2013 by Amy Barnes. Get Love Abounding in your Inbox!